The Griffin and the Dinosaur by Marc Aronson with Adrienne Mayor. Review: Ancient Greeks believed in mythical creatures. One of the most fascinating is the griffin. Even though it's a myth, could it be linked to reality? Could there be griffins watching over us, flying high in the sky. Adrienne Mayor pursues the interesting topic in the book, The Griffin and the Dinosaur by Marc Aronson. Adrienne Mayor has always been fascinated by the outdoors. The griffin also fascinated her. When Adrienne goes to Greece, she finds out the truth. This book is perfect for 11-12 year olds. It has an interesting plot that develops in an interesting way. Younger readers may not find it pleasing because of its factual format and some of the vocabulary. This book is strongly recommended and is a great read for people who enjoy Greek mythology. We would like to thank National Geographic for providing a copy of The Griffin and the Dinosaur for this review. 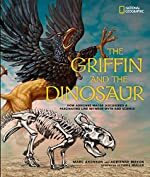 Have you read The Griffin and the Dinosaur? How would you rate it?